In this walkthrough, you create a Silverlight Business Application that displays data from two related tables in the AdventureWorks sample database. Modifying a query in the Domain Service to return related data. Modifying the domain services metadata to support loading of related data. Adding a DataPager to navigate records. Silverlight Business Applications are solutions with two projects: a Silverlight application and an ASP.NET Web Application that hosts the Silverlight application. Silverlight Business Applications have built-in functionality. By default, they have a Home page, an About page, a navigation bar, and site registration functionality. In Visual Studio 2010, create a new Silverlight Business Application project in Visual Basic or C# named AdventureWorksOrders. The procedure for completing this task is described in the Walkthrough: Using the Silverlight Business Application Template. The AdventureWorksOrders solution is created with two projects: an AdventureWorksOrders Silverlight project and an AdventureWorksOrders.Web Web application project. In Solution Explorer, expand the AdventureWorksOrders project. 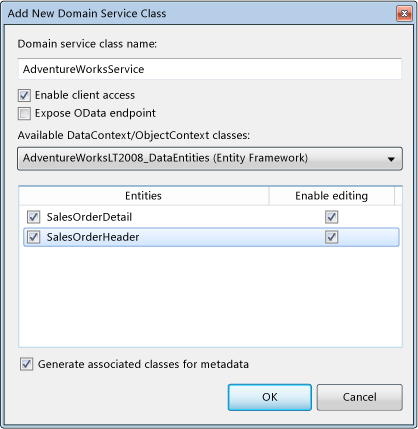 Change the ApplicationName resource string Value to Adventure Works Orders. In Solution Explorer, right-click AdventureWorksOrders.Web, click Add, and then click New Item. Add check marks next to the SalesOrderDetail (SalesLT) and SalesOrderHeader (SalesLT) tables. The SalesOrderDetail and SalesOrderHeader tables appear in the Entity Designer. Select the Enable editing check boxes for both the SalesOrderDetail and SalesOrderHeader entities. The domain service provides default operations that you should modify for your specific application. In this procedure, you edit the GetSalesOrderHeaders query so that it returns the related SalesOrderDetail records. Adding a sort order to the query is also required for the DataPager to run. In Solution Explorer, double-click AdventureWorksService.metadata.vb or AdventureWorksService.metadata.cs. In this procedure, you add an Orders page to display data from the tables. In Solution Explorer, in AdventureWorksOrders, right-click the Views folder and add a new item. In the Add New Item dialog box, click the Silverlight category and then click the Silverlight Page template. Change the name to Orders.xaml, and then click Add. In this procedure, you add a button to the application's home page that navigates to the Orders page. In XAML view add the following code after the <HyperlinkButton x:Name="Link2" ... /> line. The Orders button should appear in the navigation bar. The blank Orders page appears. In this procedure, you create data bound controls on the Orders page by dragging items from the Data Sources window directly to the designer. You first create a DataGrid that displays basic information about an individual order, such as Account Number, CustomerID, and Amount Due. Then you create a Grid control that lists the individual items in that order. In Solution Explorer, double-click Orders.xaml. Click the SalesOrderHeader node and then click the drop-down menu. From the Data Sources window, drag the SalesOrderHeader node to the designer. 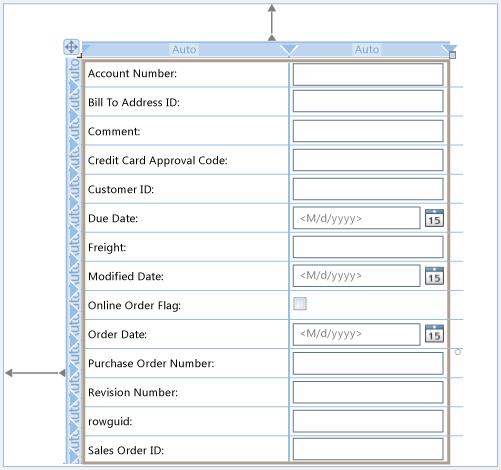 A Grid is created that is populated with controls for the data fields from the SalesOrderHeader table. 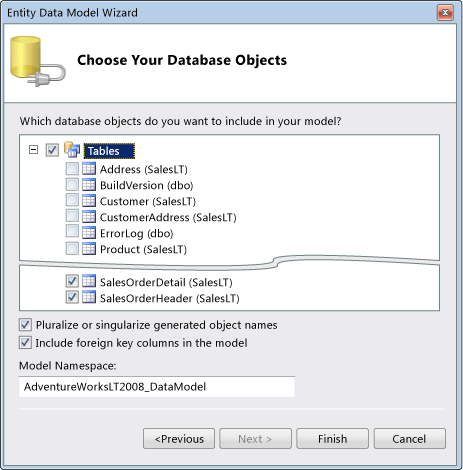 In the Data Sources window, expand the SalesOrderHeader node. Click the SalesOrderDetails node (the child node of the SalesOrderHeader node). Drag the SalesOrderDetails node to the designer next to the individual order controls. A DataGrid is created that is populated with fields from the SalesOrderDetail table. The DataPager requires that its data source is explicitly sorted. That is why the OrderBy clause was added to the query earlier in this walkthrough. Locate the DataPager control in the Toolbox. Drag the DataPager to the designer. 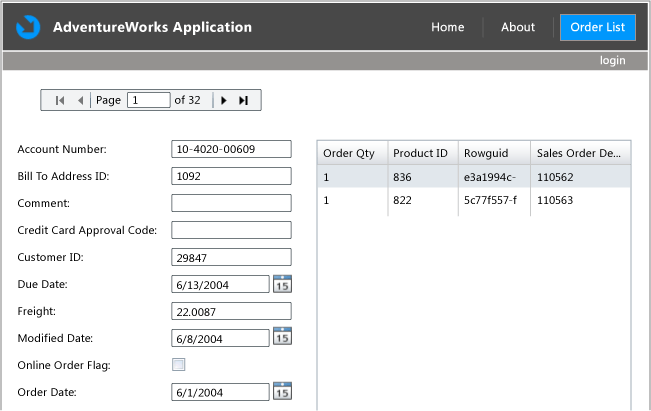 In the Data Sources window, click the SalesOrderHeader node. Drag the SalesOrderHeader node to the DataPager. In the Properties window, set the PageSize property to 1. Click the navigation buttons on the DataPager buttons to navigate through order records. 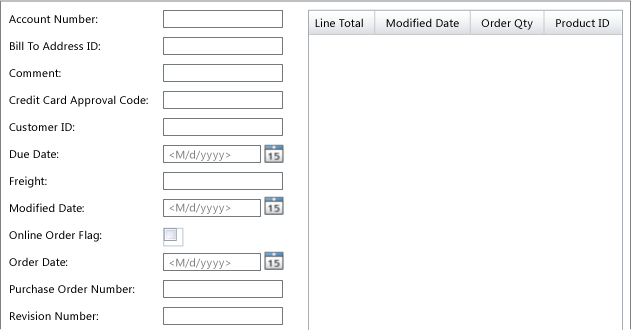 Note that the related order details appear in the DataGrid when navigating through the order header records. Modify records and save changes back to the database. For more information, see Walkthrough: Editing Data From a Domain Service.